1Place the flour in a pile on your work surface. Make a well in the top and crack in the eggs. Stir gently with a fork, then continue to blend, using your hands, until the dough comes together. Wrap in plastic or cover with a towel and let rest for 30 minutes. 2Wash and clean the Swiss chard; cook in salted boiling water. Drain, squeeze and finely mince. 3Mix the Swiss chard with ricotta, salt, pepper, nutmeg, and 3/4 of the Parmigiano Reggiano cheese. 4Roll out the pasta dough with a pasta machine in order to obtain a sheet. 5Place some filling on one half of the sheet; fold the other half on top. 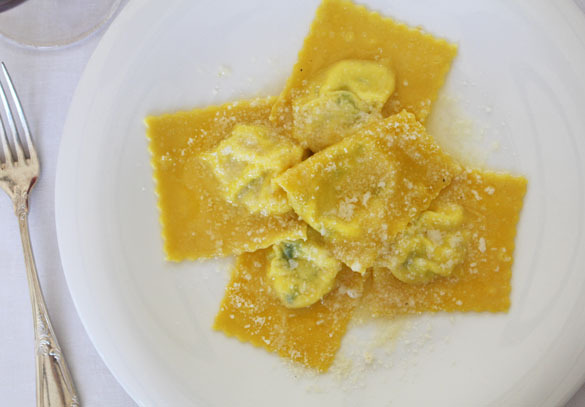 6Seal properly with your hands and, using a pasta cutter, cut the tortelli. 7Cook in salted boiling water, drain them and sauté them in melted butter. 8Sprinkle with the rest of the Parmigiano and serve.